This post is a continuation of the process of moving the information from an older static html page, into this wordpress post. It began on this post of My Expedition E350 aircraft being built in the factory..
Summer 2010 I’m flying solo now, and the plane is at 42 hours. I’ve given lots of rides to friends and family. We did a really fun mountain flight to Abraham lake near Nordegg, Alberta, and tried to get to Ram Falls airstrip, but a raining cloud was stuck over that airstrip, sadly. Sept 27, 2010. I’m at 47.5 hours now. I had a great weekend flight, from Camrose to Edmonton City Center to pick up my daughter, and then delivered her to Lacombe, and from there, west to the mountains, where I found the Ram Falls airstrip. It had a big animal, ( a moose or bear or buffalo), on the center of the runway. 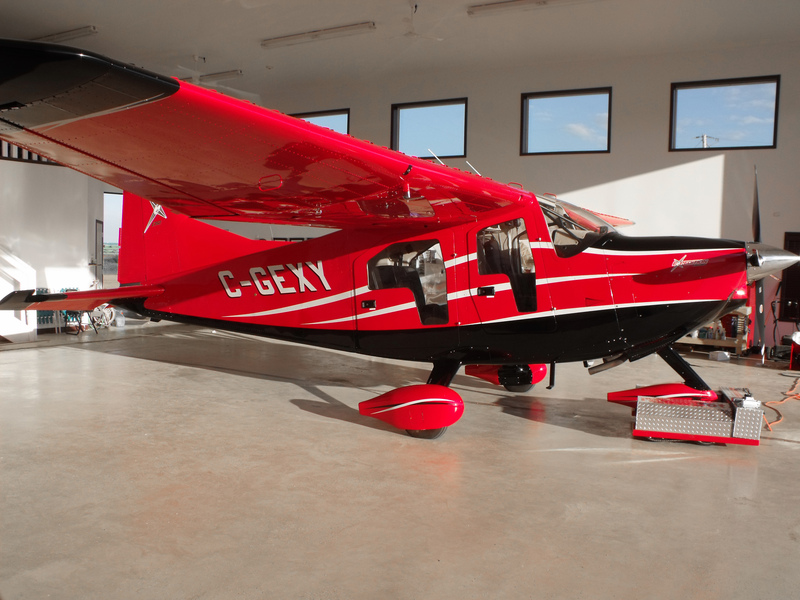 Here’s a picture of the plane in my hangar. Some comments. Notice the Towbot under the nosewheel. Although this was kind of expensive, (from Trace Towbots), its Fantastic. The plane is too heavy for one person to push around, this towbot makes it easy and fun. 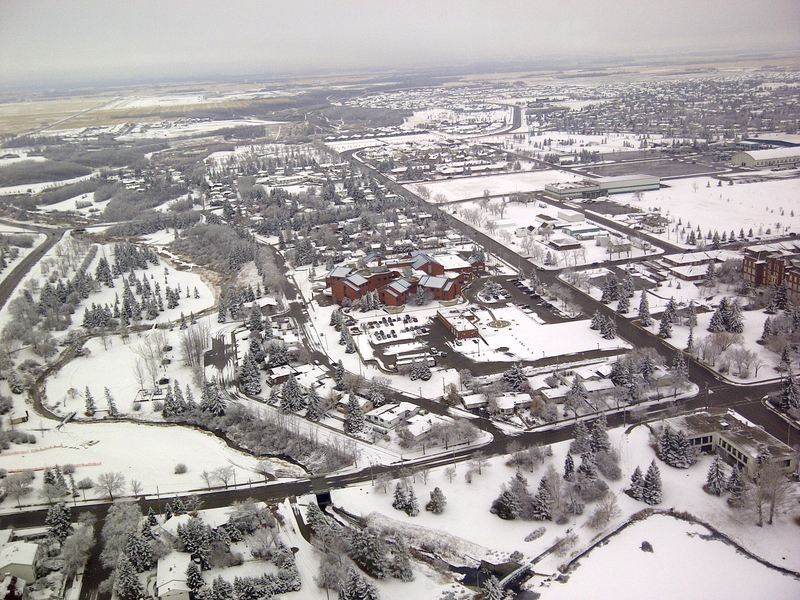 Here’s some pics of flying near Camrose. October 13, 2010. My airplane is 52 hours airtime now. Here’s an extremely cool video showing how stable the airplane is for E350 stall and spins. October 15, 2010. My first long flight over the mountains. Camrose to the BC coast and back. Of note, I got a 656 nautical miles range on one full tank of gas. April 24, 2011. My plane at 75 hours airtime. Just got back from trip to Hudson Island. My daughter took this amazing video of the landing. July 1, 2011. Annual maintenance done. Plane at 80.7 hrs. 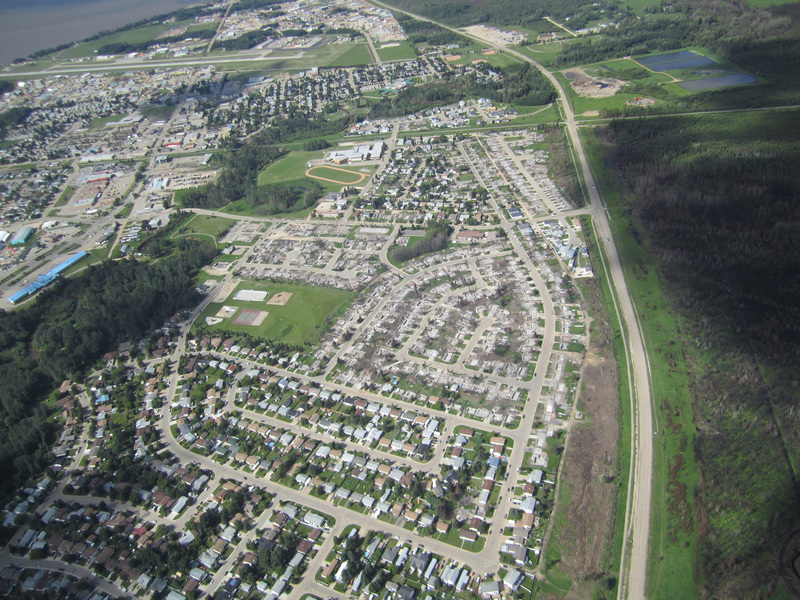 Today I flew to Slave lake to see the extend of the burned community. It was a lot of homes destroyed by the forest fire. The red highlighted area shows what burned. Click to see higher resolution. July 24, 2011. A few interesting flights. 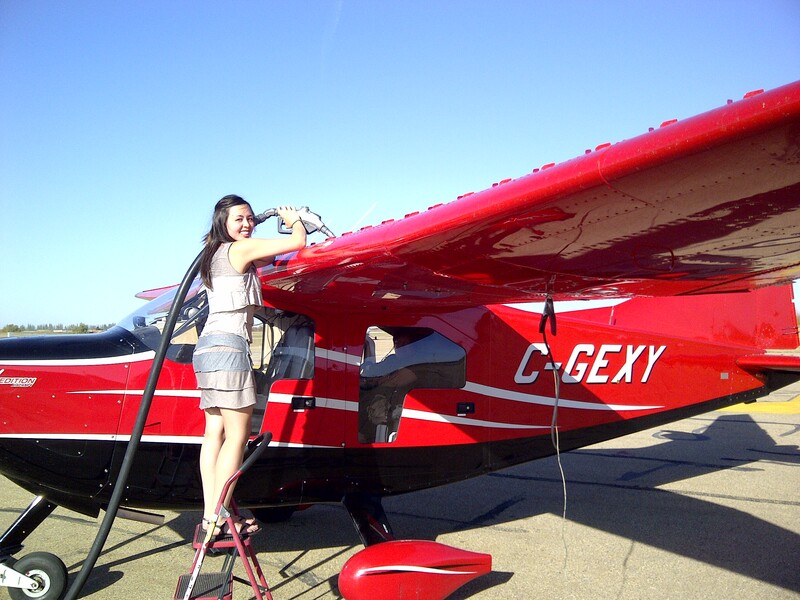 One flight was 1:50 hrs out to Prince Albert, 2:15 hrs back, with pretty high winds. (49 tailwind out, 29 headwind back (flying VERY low.) My landing in PA was at the edge of a thunderstorm, very dark and gusty crosswind, and some downdrafts, but the airplane was excellent, with power to out-climb those downdrafts, and no trouble with the crosswinds. My other flight was to the mountains, landing on grass airstrips at Hinton old entrance, and Jasper. It was a hot summer day, with airstrips at around 3500 ft. My take-offs were very pleasing. What I noticed was: using soft-field technique, I was pulling the nose up, and the nose-wheel literally was off the ground, starting at speeds in the mid-30s. So I was doing a "wheelie" down the runway until my rear tires left the ground, which is nice indication of the power of the engine, and I thought to myself.. who needs a taildragger? Also, these last few flights I’ve had fun by trimming everything to perfection and flying mostly with hands off the yoke, and just occasionally tapping the pedals to adjust my wings and heading. Oh, and people still take pictures of my airplane, where-ever it lands. October 5, 2011. Updates of recent events. I got the autopilot installed, and I love it. Totally worth the cost! My daughter recently got her private pilot license, and now she’s completed 10 hours of dual- training in the Expedition E350 with me. We’ve had a wonderful father-daughter time recently, flying around to land on grass airstrips, and finding various abandoned airstrips by their GPS coordinates, and we did some mountain flying together over Kananaskis lakes during 50 Knot winds, which was a good learning experience for us both ( and no worries, we were safe). Here’s a video of my daughter doing a touch and go, and I think it very nicely shows the roominess of the cockpit, and the spectacular uncrowded glass panels. I also love the engine sound, even a year later. December 04, 2011. Learning from mistakes. We had a great adventure. Flying from Camrose to Revelstoke, skiing, then flying home in the evening. A few things were "less than perfect". In the morning, we got the plane stuck in snow drifts while taxing from my hangar toward a common taxiway. While digging out, I bumped my head on the propeller and lost my glasses in the snow. Then, after skiing, I discovered I had left the power switch on, and drained the battery. But my amazing luck, some mechanics were working in a Revelstoke hangar on a helicopter, and they had a rig for boosting airplanes. Thank-goodness I bought that option to plug-in the Cessna-style battery connectors! That saved us! So we left Revelstoke just before sunset, and flew at 12,000 over the first clump of mountains until Golden (picture below). At this point, darkness was all around us, and cloud ceiling was dropping to 10,000. 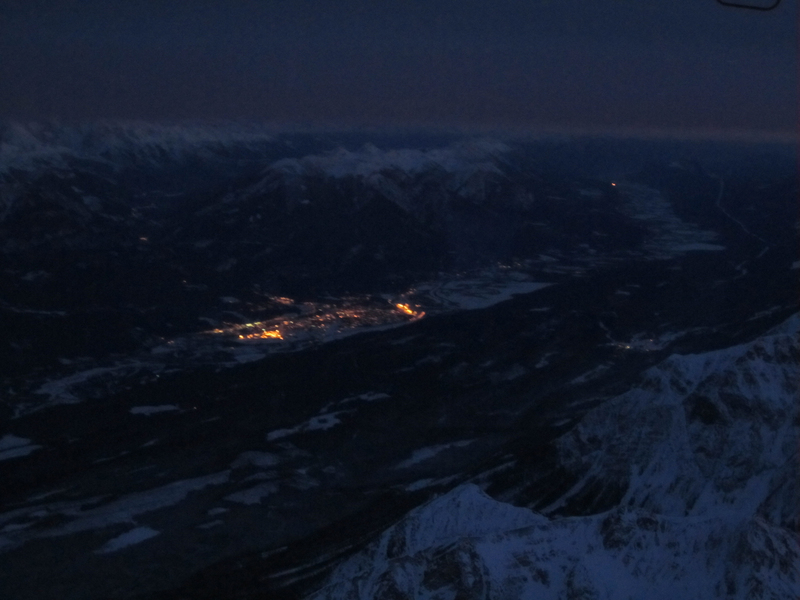 But there was enough moonlight, and nice contrast between white mountain tops and darker valleys, that I could keep flying VFR, so we flew the valleys from Golden to Abraham lake. 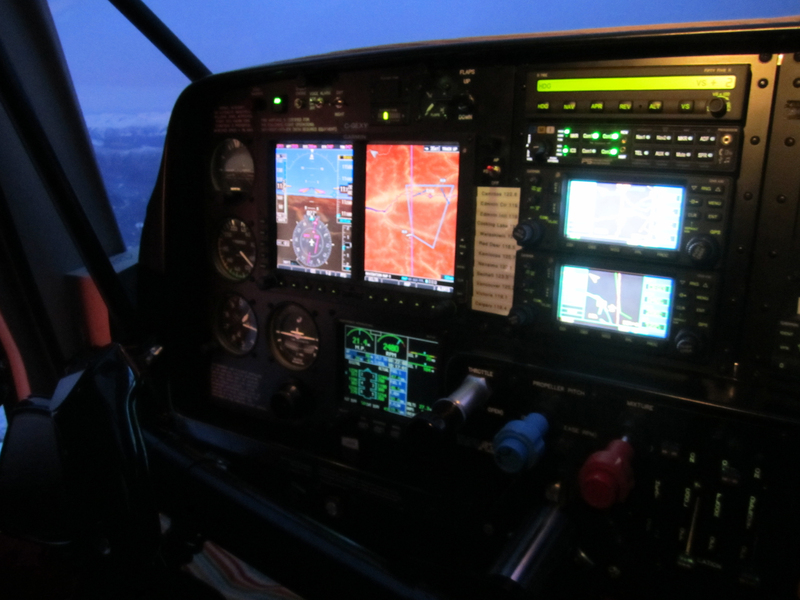 It sounds risky in theory, with the G500 showing the synthetic vision and the detailed topographic map of the valleys, I never had a moment of doubt, (and I could dim the cabin instruments and still see everything I needed to see out the window.) But there’s no doubt the G500 was a confidence enhancer. January 05, 2012. It was getting onerous to add new posts into this single page, so I’ve moved my flying-related blog posts into a new place. Click here for my further adventures flying the Expedition E350.